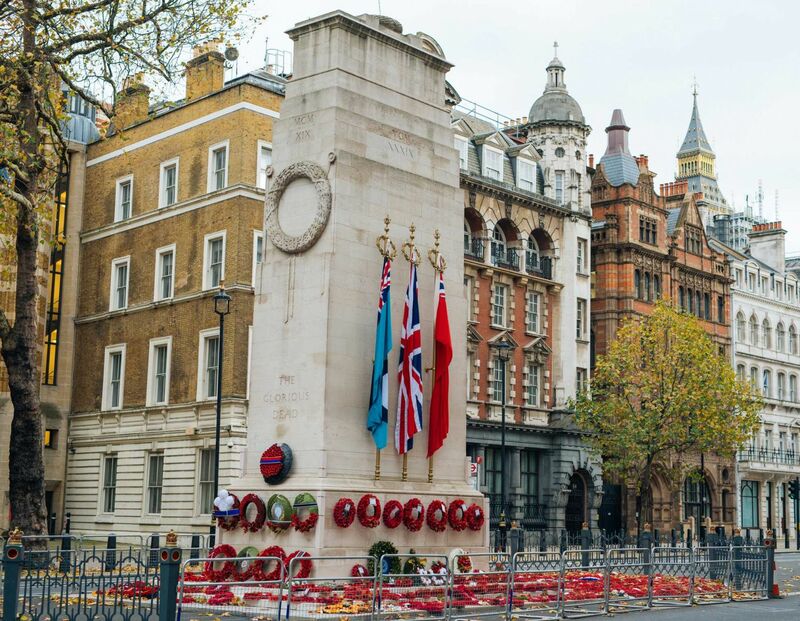 he Cenotaph in Whitehall in London [see below], based on the concept of an empty tomb honoring dead lying elsewhere, is the best known of the 54,000 British World War I memorials. Elegant, austere, simple in appearance yet rigorously logical, even mathematical, it became the epicenter of British mourning and remains so today. It's a brilliant piece of civic art. It's deliberately abstract to represent all communities and to stand as a monument to democracy and equality as much as to loss. It salutes no religion, no nation, and no one individual’s victory. The Cenotaph's aesthetic recurred over and over in the official cemeteries. Each featured a huge cross, acknowledging the Christian character of the winners, and a big, nondenominational monument called "the Stone." Edwin Lutyens was one of the architects who designed the austere monoliths. Some, like Reginald Blomfield's Menin Gate at Ypres, included the names of over 50,000 missing soldiers, many blown to bits by shells. They draw from the pre-Christian and prehistoric Druid rocks at Stonehenge. They're also smooth, pure, and clean. There's much of early Greek temple design, especially the austerity and discipline of Doric style. Intellectually, they suggest the implacable restraint and high purpose at the heart of Roman virtue. Enlisted men and officers were mixed together. A Welsh coal miner's son could be buried next to a viscount. From terrain rent by trenches and shells, for the living mired in disillusion and grief, in honor of dead lost in horrible circumstances were now stretches of sanity, order, and tranquility. A big mix of architects, designers, politicians, and civil servants were involved in the war cemeteries movement. Many were socialists of various stripes who believed the cemetery aesthetic promoted unity, commonality, and the perfectibility of mankind. Many believed they were creating modern holy shrines. Of course, the props were all dead and couldn't offer their opinions. Still, the core aesthetics are so simple, so austere, so egalitarian that the individual viewer, whether a tourist or a mourner, could dress them up with whatever emotion he felt. Enormous controversies unfolded at first over how much discretion families would have where their dead were identified. Could the dead be repatriated? Almost never. Were epitaphs possible? Yes, but pithy and only when approved. Options for gravestone design? Almost none. A cross carved on the headstone was fine but each marker was an agnostic rectangle. Could brothers be buried next to each other? No, unless they died on the same battlefield. Could the missing each have his own headstone? No. There would be no fake graves. The missing would be listed on a separate monument in each cemetery. Even amid outcry over the scheme's regimentation, within a few years about 600,000 British dead were located, usually exhumed and reburied in over 1,000 official cemeteries in France and Belgium but also in far flung places like the Balkans, Gallipoli, and Palestine. 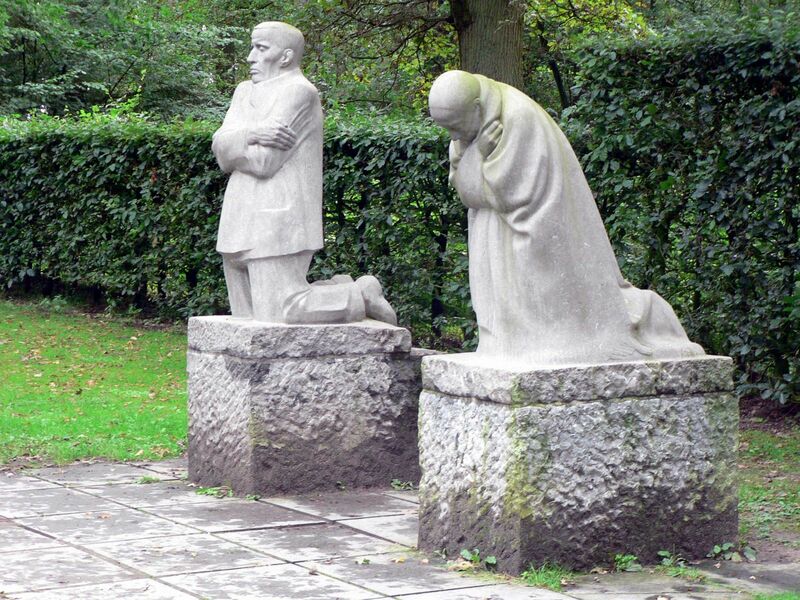 The German story is different, best seen in Kathe Kollwitz's "Grieving Parents," [see above] two sculptures done in 1931 for a cemetery for German war dead in Belgium. Kollwitz's son died in Flanders, and the sculptures depict her and her husband. The German cemeteries on the Western Front are few, small, isolated, and off the tourist track. One emotion—grief—displaced everything else, unassuaged by victory, since there was none, or reconciliation, as defeat was so bitter, or vengeance, widely sought in Germany but not allowed on victor's land. Germany's system of government collapsed, as did its economy. It had nothing to show for its herculean efforts but poverty, unrest, despair, and dissolution. The postwar hangover in Britain was channeled in large part into a craze over memorials. For the Germans, art in the 1920s sprang from defeat and collapse. Though the Allies barely won, dragged across the finish line by the Americans, a win is a win. The British Nation, its Parliament, and its systems staggered but remained intact. The more positive climate had room for Stanley Spencer's wacky, exuberant Christ-Comes-to-Cookham pictures [see above]. No one can call Spencer escapist. During the war he served in the trenches, drove an ambulance, and was an orderly in a military hospital for the shell shocked. Cool, elegant portraits of aristocrats were plentiful. German art in the 1920s was more visceral and gutsy. French art? There are two Picassos in the show, but, as I keep reminding people, he was Spanish, not French. Georges Braque is in the show with a dreadful picture showing that his war injuries hastened the loss of career mojo that had started around 1911. Leger is there, with his pretty machine aesthetic art. The war, it seems, knocked the wind from French art. After wave after wave of avant garde movements starting with Watteau in the 1720s, French painting had nothing big and new to say. I'm not sure whether the Tate had budget issues, but there's nothing by Matisse in the show, though he painted gloomy, crypto-Cubist pictures in 1914 through 1917 and desperately tried to enlist but was rejected because of a weak heart. And where's Monet? Giverny, where Monet stayed and with the war in mind painted major waterlily cycles was about ninety miles from the Somme battlefield. He often corresponded with his old friend, French president Georges Clemenceau, about his patriotic fervor and his art. The Tate is a city museum with enough space to host big shows. This makes some of its shows, such as "Aftermath," so big and diffuse that they're surveys. A deep dive into, for instance, wartime and postwar German art, British memorials, or postwar prints would result in an exhibit with a focus far too narrow to attract the big audience—and big revenues—the Tate expects and most likely needs. I thought the last sections of the show treating "The Return To Order" and "Imagining Post-War Society" might be too aspirational. The show accelerates through many movements that together tell us that the spirit of the time was directionless except at the moments when everything seemed to be falling to pieces. Its final section, "A New City," is supposed to sound a positive note, with German avant garde architects embracing radical Bauhaus functionality and more than a few artists thinking America—its freshness, freedom, and skyscrapers—might be a good place for them to direct their energies. But it's hard to think positive thoughts: we know how the story ends. If there is any country in the immediate postwar world that still looks like itself today, it's America. American artists were enlisted to market the war and I think "American Art and World War I" is correct in presenting American war posters as the best art to come from the States. Journalism, advertising, and what most would consider high art in America are incestuous. No country was more obsessed with news and mass media marketing than the United States, which is why lots of American artists starting with Winslow Homer and running through the Ashcan School came from the newspaper and magazine world. The show captures the aesthetic and its roots. George Bellows's best war works were his black and white lithographs, each with the look of a drawing done quickly to catch a news moment. His war paintings are clunkers. Some of the finest artists in the country produced poster art. 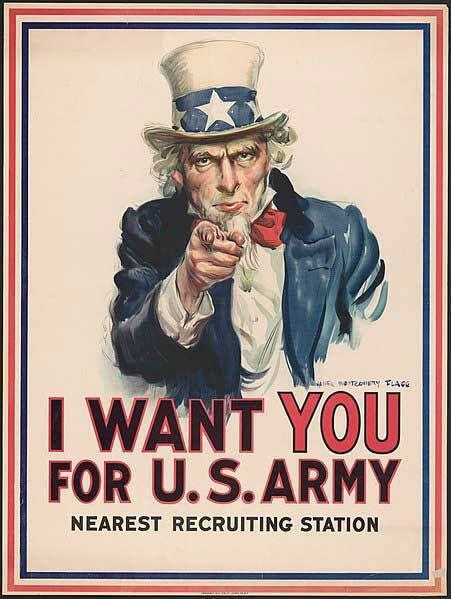 Recruiters still use James Montgomery Flagg's Uncle Sam [see above] today. The best are like jaunty, bright, to the point billboards. They're also obsessed with gender roles. They visually demanded men prove their manliness by enlisting. Women are chaste, weak, and victims. The German Hun was a forerunner to Godzilla, a King Kong with no couth, preying on women and children. Seeing the show drives home a basic point about American art from any era: it's unusually gender focused as if gender norms need constantly to be rehashed, rehearsed, and reinforced. There's an enormous amount of art about flag waving, too. 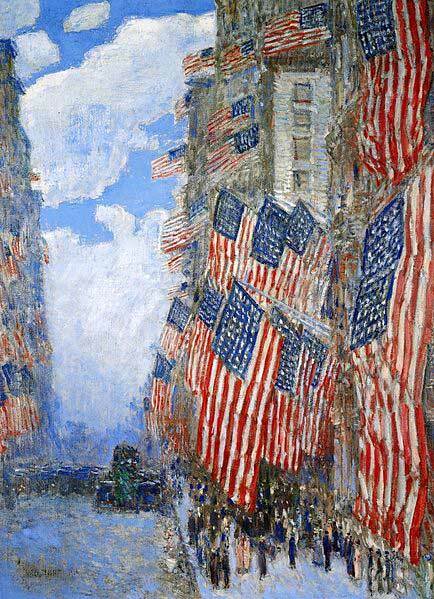 Childe Hassam's series of flag and parade paintings [see below] from 1917 and 1918 are all red, white, and blue, sparkling skies, and Easter Parade meets Fourth of July. For a while, the war was a great party. And, as in almost all wars in which America has been a combatant, from the War of 1812 to the Iraq and Afghan wars today, World War I left Americans pissed off. 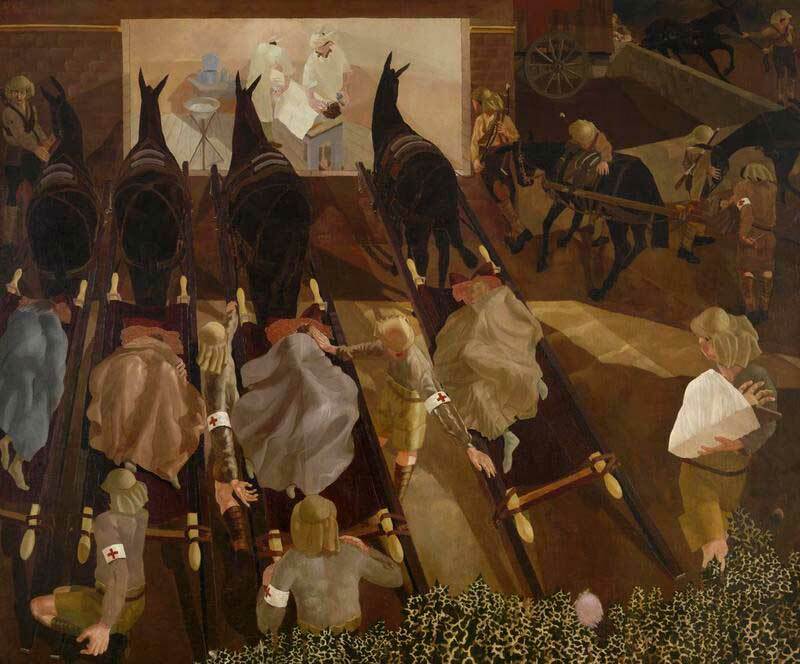 The show ends with John Steuart Curry's "Parade to War," a 1938 painting of World War I soldiers with the faces of skulls marching in formation. American casualties were light—combat was confined to a few months—but the belief was by then well entrenched that Americans dying for Europe was a waste of life. For all the flag waving, the war was never particularly popular. Woodrow Wilson famously campaigned against it in 1916, winning a razor-thin reelection as a consequence. During the war, inflation skyrocketed, shortages were pervasive, and labor strife toxic. It was seen afterwards as a wasted win. Even before the Armistice, Wilson's Democrats were repudiated in the 1918 election and massacred in 1920 by the "return to normalcy" offered by Warren Harding. In 1919, Wilson was in Paris for months negotiating among the major victors. The treaty he brought home flopped. His strident, inflexible advocacy of it left people cold. Americans were aghast at the continued violence in Europe. Atrocity propaganda starting in 1915 to gin up support for the British and French had its "no weapons of mass destruction found" moment during postwar official inquiries. In the 1920s, there was no American market for triumphalist art. It wasn't cynicism or bitterness that moved the country. "The business of America is business," Calvin Coolidge correctly observed. Foreign adventures need not apply.